Unless you’ve had your head stuck in a bucket this last three years, you’ll be aware that the next edition of the American Psychiatric Association’s diagnostic manual is slated for release this May. APA has spent $25 million on the development of DSM-5. DSM-5 will be published by American Psychiatric Publishing Inc. and planned for release at the APA’s 166th Annual Meeting in San Francisco (May 18-22). A hardback copy is going to set you back $199, though paid up members of the American Psychiatric Association are being offered a discount. Psychiatrists, psychologists, primary health care physicians, therapists, counselors, social workers and allied health professionals don’t have to use DSM-5. Instead, when codes are required they can use the codes in Chapter 5 of ICD-9-CM (Mental Disorders) and Chapter 5 of ICD-10-CM (Mental, Behavioral and Neurodevelopmental disorders), when ICD-10-CM is implemented*. *Effective implementation date for ICD-10-CM (and ICD-10-PCS) is currently October 1, 2014. Until that time the codes in ICD-10-CM are not valid for any purpose or use. Don’t like it? Don’t use it. Use ICD codes instead. Since 2003, ICD-9-CM diagnostic codes have been mandated for third-party billing and reporting by HIPAA for all electronic transactions for billing and reimbursement. 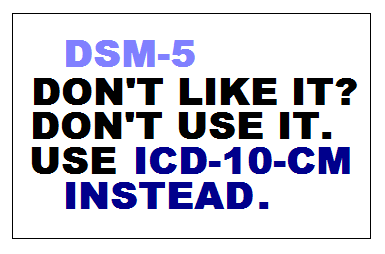 The codes in DSM are crosswalked to ICD codes. So you can use ICD-9-CM codes. And when ICD-10-CM is implemented, it isn’t going to cost you a cent – it will be freely available on the internet. Price Gouging: Why Will DSM-5 Cost $199 a Copy? Last week the APA launched new pages to promote DSM-5. The DSM-5 Task Force chair discusses conceptual themes driving changes to the new manual. This is the first in a series continuing through May that will summarize the diagnostic and organizational differences between DSM-IV and DSM-5. Go here for the DSM-5 Collection. New DSM-5 Series Includes Supplementary Information; Order Your Manual Now! How and why was DSM-5 developed? What has been the goal for revising DSM-5? What are the changes to autism spectrum disorder in DSM-5? What will be the impact of DSM-5 changes to autism spectrum disorder? What are the changes to learning disorder in DSM-5? What will be the impact of the revised specific learning disorder diagnosis? The APA’s DSM-5 Development site can still be found here DSM-5 Development. Proposals for changes to DSM-IV categories and criteria, as they had stood at the third draft, were frozen on June 15, 2012. Any revisions made to criteria sets following closure of the third and final comment period are subject to embargo and the DSM-5 Development site has not been updated to reflect changes made to categories and criteria beyond June 15. The entire third draft of proposals was removed from the DSM-5 Development site on November 15. You can read APA’s rationale for removing the draft on an updated Permissions, Licensing & Reprints page.